This summer remember the simple toys for outdoor summer fun.My earliest play memories are of baking sand "pies" by mixing sand and water in buckets. We didn't have many fancy toys when I was young, but we had lots of fun. The simple toys are often the best. 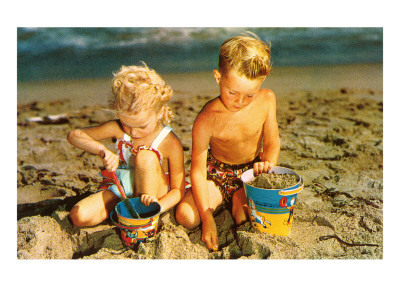 Buy your kids inexpensive pails and shovels to play with at home or on the beach. They'll be happy for hours, and happy kids make for happy parents! Photo thanks to flickr and downing.amanda under the commercial use license. Water and sand play is not only great fun, it's a learning experience too. Learning through sand and water play. From the UK site Topmarks, this is the first of a series of articles on the subject. Helpful hints for parents. The benefits of and play for toddlers. An excellent article from the Parents Social website. Have you forgotten how much fun you can have with buckets? Or if you're in the UK- Buckets and spades in the sandpit. When I started to research this page, I knew that the toy that I loved as a child, the sand pit, was called a sandbox in the USA. What I hadn't realised was that the phrase we use all the time in the UK -"Buckets and Spades" translates as "Pails and shovels" in the USA. Hey Ho, don't you just learn something new every day? There's nothing new about these toys though. I'll bet that even back in ancient times children poured water from one thing into another thing and thought it was great fun. Pouring water from one bucket to another bucket is a great learning opportunity. Kids get to realise that if they are pouring from a large bucket to a smaller bucket, there will be water that won't go in, and vice versa, It's all about Volume. It's basic Physics! It's a concept that is easy to grasp whilst having fun. Here I'm picking out some of the best buckets and shovels for your kids to play with this summer. I'm not suggesting that you forget the more sophisticated toys on the market, but just reminding you that the simple things can be great. Buckets have stood the test of time as a great outdoor play toy for kids. Do you need sand with buckets? Sand is great, but not essential for bucket learning play. 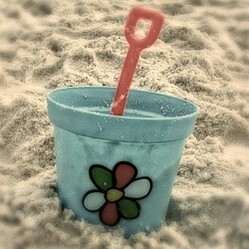 All the bucket sets above are great if you have a sandbox, or if you go to the beach. Not everyone has room for a sandbox at home, and many of us live far from a beach, but if you're imaginative you can work out ways to use buckets for fun and learning. For example, smaller buckets can be used at bath time. Fill one bucket that is slightly larger than the second bucket, tip water backwards and forwards and see what happens. If the weather is fine, take a plastic bowl from the kitchen out into the yard and experiment with buckets there. I live near a lake- there's water there for kids to play with. The pebbles on the lake shore are another learning tool for children. Fill a bucket- how heavy is it? Fill it with water- same weight? Is there a children's outdoor play pool in your nearest park? Are there places your child can go dig in a garden and fill their buckets? Children love filling things with stuff, moving it, then emptying it again! Use your imagination. The simple toys are sometimes overlooked in this high tech age. Don't forget buckets! This is the most highly rated sandbox available right now. If you have space for a sandbox, this is the best. Buy Buckets! Cheap, good, healthy and educational fun for kids. Did you play with buckets as a kid? Do your kids play with buckets? I'd love to hear from you. WhiteMoss, It's interesting how such a fun thing as playing with buckets prepares kids to carry groceries and handle loads later on in life! Thanks . You're right, watering the garden is great fun! England's beautiful Lake District is a natural playground. Kids love skimming pebbles, scrambling up hills and getting muddy. Here are the best things for kids in the Lakes.